It is well known that the Cordeliers or Franciscans and the Jacobins or Dominicans have detested each other ever since they were founded. They were divided on several points of theology as well as being financial rivals. Their chief quarrel turned on the state of Mary before her birth. The Franciscans argued that Mary had not sinned in her mother’s womb, while the Dominicans were of the opposite opinion. There never was, perhaps, a more ridiculous question, and yet it was this very matter which made these two religious orders quite irreconcilable. The Dominicans held a meeting to plan their revenge, and, in the hope of heaping greater humiliation on the Franciscans, they resolved to perform miracles. After several fruitless attempts they finally found a favourable opportunity in Berne. One of their monks was confessor to a simple-minded young tailor named Jetzer, who was particularly devoted to the Virgin Mary and to Saint Barbara. This imbecile seemed to them to be an excellent subject for miracles. His confessor convinced him that the Virgin and Saint Barbara expressly commanded him to become a Dominican and to give all his money to the order. Jetzer obeyed and too the habit. When his vocation had been well tested, four Dominicans, whose names appear in the subsequent trial, disguised themselves on several occasions as best they could, one as an angel, another as a soul in purgatory, a third as the Virgin Mary and the fourth as Saint Barbara. At the end of these apparitions, which it would be too tedious to describe in detail, the Virgin finally revealed to Jetzer that she was born in original sin; that she would have been damned if her son, who was not yet on this earth, had not taken care to regenerate her immediately after she was born; that the Franciscans were impious and had grievously offended her son by claiming that his mother had been conceived without mortal sin, and that she charged him to announce this to all the servants of God and Mary in Berne. Jetzer did not fail to do this. Mary appeared again, accompanied by two robust and vigorous angels. She thanked him and said that she had come to imprint upon him the holy stigmata of her son as proof of his mission and as a reward. The two angels tied Jetzer up and the Virgin drove nails into his hands and feet. The next day Brother Jetzer was exhibited on the altar for all to see, freshly bleeding from the heavenly favours he had received. The devout flocked to kiss his wounds. He performed as many miracles as he wanted, but the apparitions still continued. Finally Jetzer recognised the voice of the sub-prior beneath the mask he wore. He cried out and threatened to reveal everything. He followed the sub-prior into his cell, where he found his confessor and the two angels, who were entertaining some girls. The monks, now that they were unmasked, had only one course open to them, which was to poison Jetzer. They sprinkled a communion wafer with some corrosive which had such a foul taste that Jetzer could not swallow it. He fled from the church crying out against the sacrilegious poisoners. The trial lasted for two years and came before the bishop of Lausanne because at that time laymen were not allowed to judge monks. The bishop sided with the Dominicans. He decided that the apparitions were real and that Jetzer was an imposter; he was even so cruel as to sentence the poor man to torture. But later the Dominicans imprudently degraded Jetzer, stripping him of his monk’s habit. This meant that Jetzer was now a layman again and his case could therefore be heard by the Council of Berne. As a consequence of his testimony the long catalogue of crimes was confirmed. When the ecclesiastical judges were called in from Rome, they were compelled to deliver up the criminals to the secular authorities. The guilty were burnt at the Marsilly gate on 31 May 1509. Records of the trial are now in the archives of Berne and have been printed on several occasions. 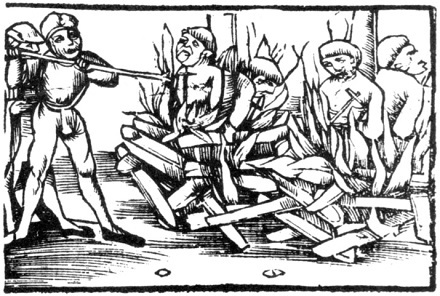 The fourteenth panel (click for the full glorious graphic novel) of a woodcut series illustrating the progress of the hoax. (Via). * The Dominican Wigand Wirt, who denounced the Immaculate Conception so vociferously that he was summoned to Rome in 1507 to answer for it.